When you use an online bank without a physical branch near you such as Ally Bank or USAA for your main checking account, sometimes it’s helpful to keep a local bank account as a backup for what you need done in person at a branch. I use a Citi Checking account for this purpose. I opened a checking account at Citibank in a Basic Banking package last October when the bank was running a promotion. The checking account has no minimum balance. One direct deposit and one bill payment per month waives the monthly fee. I set up a monthly recurring ACH deposit from my main checking account to it. I scheduled a monthly recurring bill payment to a credit card from it. These two transactions on autopilot keep the account free every month. From the promotion, I received 10,000 ThankYou points as the signup bonus. It took a while but the points posted automatically. For having a direct deposit and a bill payment, which waives the monthly fee, I get 425 ThankYou points every month. For having a linked savings account and setting up an automatic transfer from checking to savings, I get another 175 ThankYou points every month. Altogether, after 4 months I redeemed my 12,000 ThankYou points for a $100 Amazon gift card. I’m still getting 600 ThankYou points every month like clockwork. When I have 6,000 points in 10 months, I will get another $50 Amazon gift card. You hear big banks are cutting back on free checking accounts. Here we have a big bank offering a checking account that’s better than free. You get paid $5/month for having an account with no minimum balance. Even credit unions can’t beat this deal. To me, it makes a perfect backup when you use an online bank for checking (Ally, USAA, Fidelity, Schwab, …). I got married last weekend. My wife and I are trying to consolidate bank accounts and possibly find a new one that offers value. What do you recommend? I’m currently at BofA and she is at another major bank. Seems like a pretty sweet deal! I’m a huge fan of the credit union I use. They have a branch that is reasonably convenient and if not, I can go into any credit union’s branch that does shared branching. I have a Citibank credit card. Until last Sunday my Citibank rewards strategy also involved redeeming ThankYou points for Amazon gift cards, since 2500 ThankYou points could purchase a $25 Amazon gift card ($1 for every 100 ThankYou points). However, last Sunday I went to purchase an Amazon gift card with my ThankYou points and learned that the Amazon gift cards are no longer available from the ThankYou website. However, I was able to link my Amazon.com account to my Citi ThankYou account. Then I could apply ThankYou points to my Amazon.com purchase directly. A $15.98 purchase cost me 1997 ThankYou points, so I think the current exchange rate is about eighty cents for every 100 ThankYou points. I just opened a Chase checking account due to their 150 to 200 USD bonus. I purchased a 200 USD coupon on Ebay. I now need to have a direct deposit post monthly to avoid an extra fee. The continual accrual of thank you points sounds great! I am tempted to go for the Citi bank offer as well. J – I don’t have a Citi credit card. The exchange ratio for me has always been 6,000 points for $50 or 12,000 points for $100. You get 100:1 when you have a Citi credit card. Although Amazon gift cards are gone from the online catalog, I heard you can still get them if you call ThankYou customer service. Chase offers free checking to military and veterans as a FYI. Jacob – I use Alliant Credit Union (anybody can join with a $10 donation to a supported charity). Ally Bank is also pretty good. Correct me if I’m wrong but typ from checking are taxable (1099). But from credit card bonuses they are not. That knocks the deal down by about 42% (state+fed) marginal rate. Foss – You are right but it’s not any different than interest paid, which is also taxable. To get $5/month you will need $6,000 earning 1% a year. Not that many banks pay even 1% these days. Here you can have $100 or $200 in the account getting paid the same as $6,000 elsewhere. @Jonathan Re-read the fine print on your Chase offer. I just opened one as well and it looked like leaving $1,500 in there was sufficient to avoid the monthly fees. If you frequent amazon, and already have thank you points, then it makes complete sense to add a citi forward credit card. You get 5% back in thank you points for movie theaters, restaurants, and book stores. The catch is every item I have ordered shipped directly from amazon.com counts as a book store purchase. Thus for me it is effectively 5% back on amazon. Since I get 5% back on amazon, I do not use amazon gift cards with thank you rewards. I get tjMaxx, which is as good as cash with my wife. I only get 1.5% back normally at TJMaxx, so I chose to not give up the 3.5% return using amazon gift cards (as those are as good as cash for us as well). Thanks for posting this, I was thinking about going for the basic checking account to get the 10k points but then I saw that you can get the next level up(citibank account package) if you maintain a 15k balance across all citi accounts(including mortgage). Since I have a mortgage with Citi I’m in luck! Harry @ PF Pro – Thank you for pointing that out! 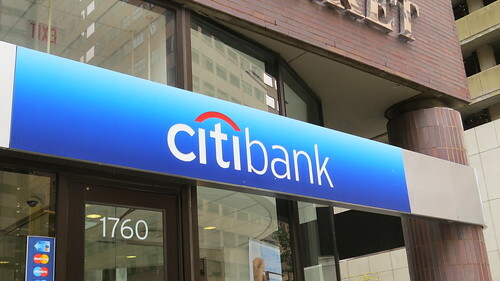 For those with a mortgage serviced by Citibank opening a Citibank Account package, the bonus would be 20,000 points and you get a free account that pays even more ThankYou points. CSR said they do a soft pull. The ongoing ThankYou points accrual is not a promotion. You get the points every month. With a mortgage and the mid-level Citibank Account package, you get 625 points for checking, 200 points for savings, 100 points for auto save, and 125 points for mortgage. That’s a total of 1,050 points per month worth $8.75 if you don’t have a Citi credit card or $10.50 if you do. What a deal! Nice, I just signed up for the Citibank Account package so I should get the 20k bonus points. I read on the application that Citi will send you a 1099 if you receive a bonus of $600 or more and since they equate 50 bonus points to $1, I may not get a 1099 for these points(20k points =$400 in Citi’s eyes), it’s up to me to report them 😉 Know anything about that? The ongoing thank you points make it even sweeter since I have a credit card, now checking and mortgage with them. I suppose I could easily sign up for a savings account and the auto save feature to get even more points. Foss, what you are probably wrong about is your estimation of the marginal tax rate that you pay. A single person living in NYC who earned $300K last year will pay about 37% at most in combined fed, state and local (city) taxes. A married couple earning $150K will only pay about a 25% marginal rate (yes, total). Unless you earn close to half a million dollars, it’s doubtful that you pay even close to 42% in taxes. 1) There are two types of savings account. Do you open the Day-to-day Savings? 2) Would a push from Alliant into the checking account count as a direct deposit? 3) Do you keep a balance in the accounts? I see there is a minimum of $500 in the savings account to avoid fees. indexfundfan – (1) Day-to-Day. (2) Yes. (3) About $100 in each. 1 ACH in and 1 billpay out waive the fee for the entire package. I have $20 ACH in from Alliant, $10 auto save to savings, $10 billpay to an AmEx card. Total balance grows by $10 per month. That should be ok to count as direct deposit right? Yes. It worked for me. Remember to schedule a recurring bill payment.